Hello, fellow Planner Enthusiasts! As I mentioned in last week’s OLJ Q&A, I have recently received some requests to share how I use my planners and there was a good amount of interest there, so I am back this week with a look into my planning sessions. I have two different kinds of planning sessions: Daily and Weekly. Every night before bed I pull out my Erin Condren Life Planner and my Filofax to plan for the next day. I enjoy doing this right before bed as it helps me focus on what I’d like to accomplish the next day while simultaneously taking care of it in a way that allows me to go to sleep with a clear mind. I used to have issues falling asleep until I started this nightly practice a few years ago. It acts very much like a “brain dump” for me; I no longer experience racing thoughts scrambling through my mind of tomorrow’s to-dos since they’re all nicely laid out for me. You’ve got to find what works for you, right? Fortunately, this short practice, which generally takes me about 10 minutes, helps my worrywart mind sleep easy. I like to start with planning my work for the next day. 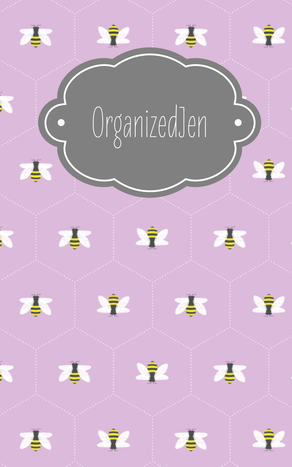 I use my Erin Condren Life Planner (which you can see more about here if you’d like) as my posting planner. The planner comes with two calendars built in: a monthly 2-day spread and a weekly 2-day spread. I use the monthly spreads to plan posts and the weekly spreads to plan out the actions I need to take on a daily basis to get my videos and blog posts up. The weekly spread is broken down into morning, day, and night time blocks. This works for me as I typically film videos and take blog photos in the morning and edit videos and photos and write my blog posts in the afternoon. I try not to do any work at night, so I leave that spot open for post-its where I’ll jot down post-related ideas or longer action lists. 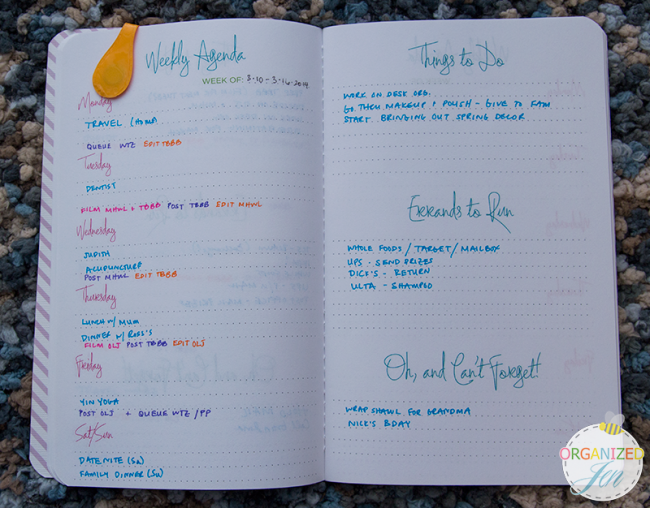 I keep my Erin Condren Life Planner open while I work on my Daily To-Do’s, which I house in my Filofax. I use an A5 Filofax (which you can read more about here if you’d like, including a look at all of my favorite accessories) as my personal calendar and planner. I keep month on 2-pages, day-on-a-page, and yearly spread calendars in my Filofax. I use the yearly spreads for trip planning only. The month on 2-pages is where I keep track of my personal calendar, including any appointments, events, or gatherings I have planned. I use the day-on-a-page calendar for my Daily To-Do’s. I always check my monthly calendar before starting my Daily To-Do list to make sure I’ve filled in anything I have scheduled on the left column of each page. Since I usually have quite a bit of space left on this side, I use that for any sticky notes or labels that help me keep track of certain tasks I’d like to accomplish that don’t necessarily fit into my to-do list. I use the right column for my list. While I do refer to the time increments that are preprinted on the page as a guideline, these tasks are not set in stone. It truly is just a tool I use to help me visualize the next day and have a plan so that I can use my time efficiently. I rarely ever exactly follow the list and usually have to bump a few things around or onto a different day. I even write in my workouts, meals, when I get ready, and when I take my dog out and groom her just so I can visualize the timing of my day better. Over the years I’ve found that this system works best for me. I recommend trial and error for finding what best suits your needs and preferences. On Sunday evenings I dedicate a bit more than my usual 10 minutes to a longer weekly planning session, which typically takes about 30 minutes. During this time I think about the week ahead and what I’d like to accomplish. 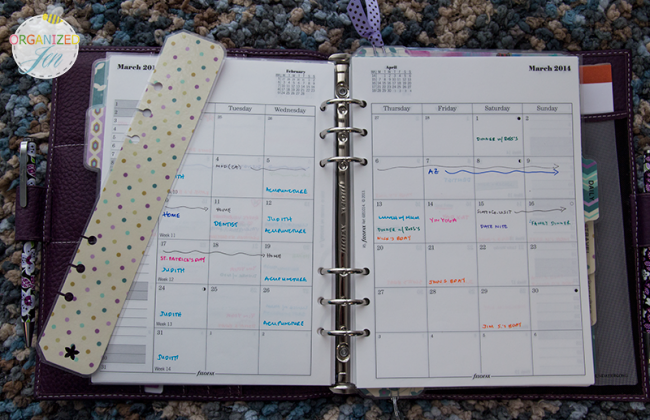 I start by checking the monthly section of my Erin Condren Life Planner where I keep track of my posting schedule. I use labels I custom made to color code my schedule. I find the use of color in this way helps me visualize better. I will add more posts I’ve come up with and/or move some around to fit my personal schedule. I add and move around posts other times during the week as well, but I do like to make a point of checking in every Sunday. I also look at my personal monthly calendar in my Filofax during my Sunday weekly planning session. I use iCal on my iPhone as my on-the-go calendar since I don’t like to carry my large planner around with me everywhere and I usually always have my phone with me. I like to sync up my two calendars on Sunday so I don’t miss any appointments or other plans I may have made on the go. Again, I fill in my monthly calendar as things pop up during the week, but like to touch base on Sunday to make sure I am synced up properly. 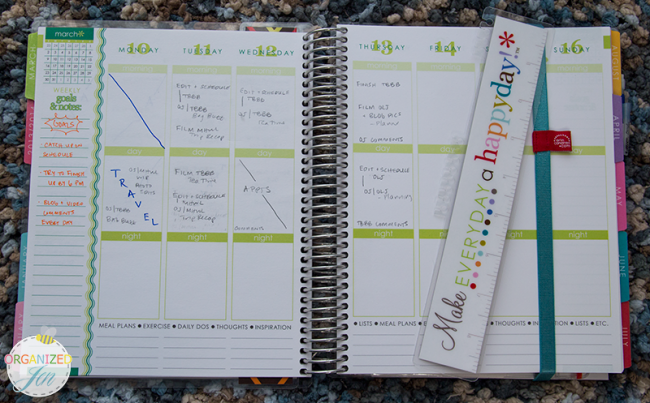 I use a May Book Weekly Agenda from May Designs as my weekly planning tool of choice. I keep this tucked into the back of my Filofax and only really pull it out on Sundays as I use it exclusively as a planning tool and not an actual calendar. I love how thin and light the book is, but it’s also cute and unique since you can personalize it to make it your own. Here you can see the exact design I chose for mine. I start by filling in any appointments or commitments I have for the week on the left side of the 2-page weekly spread. This helps me think about how I can fit in filming and editing for the week. 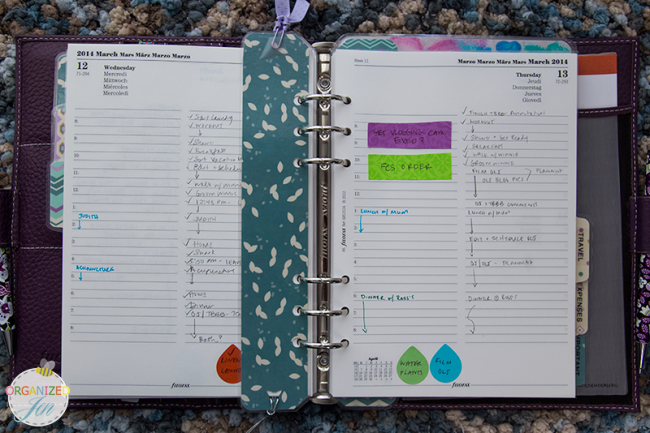 I then take a look at the posts I have planned in my monthly view from my Erin Condren Life Planner and fill in my May Book under each day what needs to be filmed, edited, and posted that day. Again, this is a guide to help me visualize the timing of my week. I then fill in the right page which leaves room to brainstorm general to-dos, errands to run, and other things I’d like to remember. I always feel like I have a better sense of how my week will shape up having completed this task. After this point I will run through my daily planning ritual for the next day and I go to sleep ready for the new week to begin. If you’re interested in Erin Condren products, you can receive $10 off your first purchase when you sign up for the Erin Condren website (which means you receive the occasional email on current promotions and new products from them) by clicking here. Thank you for the inspiring video! I am trying out different planners and journals, so it’s been fun to watch your videos on your Erin Condren Life Planner and Filofax. The way I manage my time and my family’s schedules is constantly evolving, so it’s fun to see how other people organize their lives. Your videos are full of great tips! Thank you! Also, if anyone is interested in stocking up on the Martha Stewart Home Office Removable Color-Coding Labels, they are on clearance at Staples (at least by me in New Jersey.) The 84 pack of colored tear drop labels are $1.90, regularly $3.99! Thanks for sharing info Mary I’m in NJ too, does that mean they are getting rid of them? That’s usually when then are on clearance. That’s a good question, but I’m sorry I do not know. The 84/pack was next to the 100/pack, but only the 84/pack was on clearance. I really like how you organize your planner. My daughter gave me a Day Timer for Christmas and I have not gotten into the “habit” of using it yet. I know it would make a great deal of difference in my world if I did. Being an older person I need all the help remembering things as I can get! Thanks for sharing and have a wonderful day and weekend…. So glad you did this one. Looking forward to the next. I recently picked up a couple journals. All this planner thinking must have reminded me of how I used to use journals. One will be for food. I have stomach issues and need to start looking for patterns. The other will be a travel journal. I always forget to jot down my favorite spots and things I would like to do if I return or suggestions for others who visit. One, once I get around to it, will be sort of like a vision board. Where do I see myself? How can I make it happen? etc. etc. I find things mean more when written than just when spoken. This will be a departure from things I have done in the past as it will have pictures and maybe doodles. Thanx. Love the post, I currently have my A5, Personal Size, Erin Condren, and a Project Management Journal. I pretty much do the same thing, except for I usually write down my schedule early in the morning with my cup of Tea before I head out to work. “This is my me time” Tea, Simply Abundance, Scripture of the day, and my day planning. Sunday’s for me is usually my “meal planning” for the week, and my blogging/crafting schedule. I color coordinate my schedules. I love love love my pens, stickers, washi tape, etc. Lately, I have been creating my own dividers, and I am thinking of doing seasonal ones for fun. Thank you so much for sharing!! I am definitely a planner nerd and I love it! I am looking into getting a Erin Conde planner next month, I am working on starting a blog and just need something to help me plan out things. Do you know if you can switch out the pages when t h e new year comes or do you have to order a new planner? Love watching your videos. This kind of planner is only for one year at a time. The pages are in a spiral binding which means they are not refillable. I get so frustrated when I incorporate things into my planning and it becomes too much to look at. I try things when i watch videos and it becomes to confusing. This is why I simplified my personal size holborn filofax to my calanders and am not using it for all my lists notes or too much decoration. It gets too fat and messy. I bought the dividers from charlottevictoria. I love the simplicity of my planner and the beauty of the dividers. To be honest I don’t make a lot of those kinds of lists. I usually write any work-related ideas on post-its I keep in my EC Life Planner. Any personal things I tend to journal about. I have only recently found your blog and Youtube videos. I just want you to know that you are such an inspiration to me-Just what I needed. I could sit and watch your videos all day. You do such a great job. Thank you for all your wonderful organizing topics and ideas for my EC planner which I have used the past two years, but after watching your video…this year I will get much more out of it. 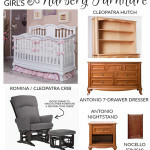 As a mommy of three and working full time as an Education Specialist-your tips are most useful! Love your style, too! How I Plan: I use three different tools. 1) A large wall calendar that shows a month at a glance. I write down schedule info, appointments, special events, travel info., etc. on this large family calendar. It stays on the wall. I purchased this at CostCo. This is for the whole family to see. 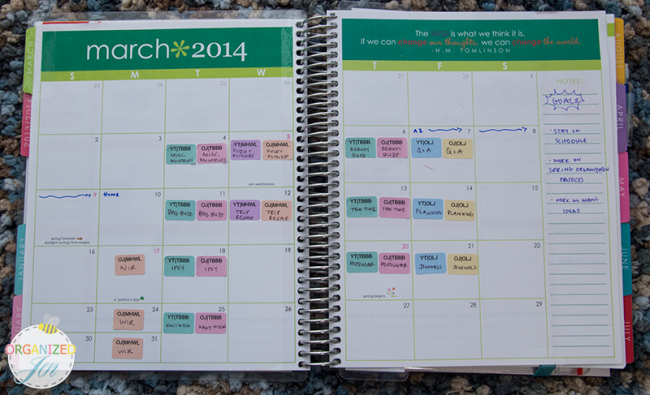 2) A very pretty week at a glance calendar that I carry with me in my purse. I co-ordinate this with the wall calendar. I purchased this at Dollarama. 3) I purchased the Motivated Moms page per day chore planner over the internet ( http://www.motivatedmoms.com). I print out a week at a time, and staple the corner. I co-ordinate this with my wall and purse calendar, but also keep a running to do list on the daily pages. I leave this at home. I have goals, but I’m not achieving them, I think because I don’t write them down . 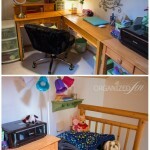 . . thanks for sharing how you organize your planners. Could you also address time management? That is a topic of interest – do you run errands every day? or shop every Tuesday? Do you have a regular day when you schedule appointments or do you go any time available? I have certain recurring appointments that are on the same days each week. I used to run errands on Tuesdays, but now I aim for Friday or Saturday mornings first thing since I am focusing more on my during the weekdays. I usually try to schedule appointments around my workload for the week and what other standing appointments I have. Can you explain why you use the third book? It’s really more of a notebook, really. I used to just use notepaper for my Sunday weekly planning sessions to help me visualize my week ahead, but once I learned about the May Book I thought I’d give it a try in place of notepaper. I actually much prefer it because of the layout! Loved the post. I found organized Jen last week when we had a snow day. I was looking for how people packed carry on bags for the plane, and saw Jen’s Vera carry on video. I was soo excited. There are people who carry the kind of stuff I do! So I watched a bunch of you tubes and got a good dose of Jen. I’m so glad there are others who like colors, too. Anyway, I love planners and sometimes switch from ringed binder to spiral Franklin Covey’s Simplicity for Moms. Thanks, Jen!! I am a fellow Planner Lover. I have to manage several schedules (work, children, house keeping, etc) and I’m always on the look for tips on how to streamline. Your idea of making stickers for planner blew my mind!!! Please elaborate in future video. Keep them coming! 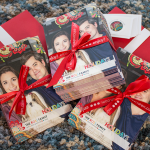 I can’t thank you enough for making this video and blog post. It sounds crazy, but I feel like we’re friends. I reached out to you asked for help like I would do to a friend. You heard me/ read it, wrote back and then showed me. Thank you. I know I said it in the past but you are such an inspiration. 2 yrs ago this April I was in the worst depression, healing from a surgery, bed ridden and 5 months pregnant. That’s when I found your videos. You pushed me to get up(when I could) and take charge of my life again. I can never thank you enough! I know you are going through something, but remember God gives us things that we can handle. Not to be mean, to us but to change us into what we are to become even if we don’t understand and it’s painful. I’m been keeping you in my prayers at night and sending positive thoughts your way. Hi Jen! I am a nearly year-long reader and would like to thank you for your precious tips, specially for home and home-office organizing. I have different planners — professional, housewife and a student ones — turned into different apps in my iPad. I keep Pocket Informant with Google Calendar, ToodleDo for to-dos, Evernote for notes, drafts, study/reference stuff and next actions, Everyday.me for a journal and Awesome Note for blogging/video/podcasting planning. I loved very much my Filofax, Moleskines, pens and stickers, but sometimes felt overwhelmed as I handle too much activities, with some kind of panic when far from my planners. I started my carreer as a homecare dentist, and you know, we dentists have a lot of tiny stuff as tools and it’s not unusual to get lost among them, LOL. Mobile tech helped me very much and I’ve been using it since 2001, with my first Palm device. It has simplified my life so much! Finally, here is my question to you: I see you are also a geeky kind of girl, with excelent choices of gadgets – Macs, cameras, iPad and iPhone always tidy and up to date. Have you ever tried to switch to a whole digital life? How did you feel, what are the issues, what do you miss the most in digital that makes you feel more comfortable with paper? Sorry for the long message, but your answer will help me (and many more people) more than you can imagine. Thanks for sharing your system. I did try to just use iCal for several years, but it really did not work at all for me. I think some people just fare better when they write things down and I’;m definitely one of them! Once I made the switch back to paper a few years ago I noticed I felt less overwhelmed, more on top of things, and just plain happier in general. I love writing in my planner and I now have one for personal life and one with our ministry schedule in it. But I put both ministry and personal stuff in my personal planner and use my iPhone calendar for on the go. I really need a new planner cover but I’m having a hard time parting with my lime green Memoryworks planner that I brought years and years ago (finding a color i like has been another issue) which is now a bit worn and torn. Unfortunately they stopped carrying planners within a year of me buying mine and I have yet to find one in the pretty bright colors I like. Thank goodness they accept Franklin refills ! Anyone have any suggestion? The Filofax one is a bit out of my price point. Plus I didn’t like the colors. Can you share what color system (when you write in the different colors) you are using for your Filofax and Erin Condren planner?